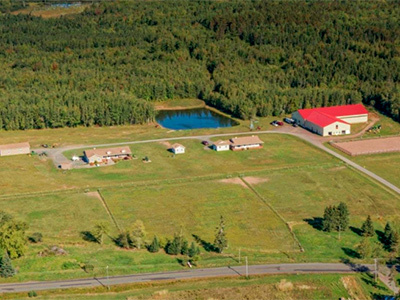 What You Get: A potential boarding stable with two homes on over 100 acres. The House: There are 2 tidy bungalows on the property, each with 3 bedrooms and 2 bathrooms. One has 2,000 sq. ft. on the main level, with an additional 2,000 sq. ft. on the lower level, which is mostly finished. It has an attached garage and a fully insulated detached garage with a bathroom. The second home is 1,300 sq. ft. on the main level, with an additional 1,300 sq. ft. on the lower level, which is mostly finished. It has an attached garage. The Barn: The steel construction barn has 17 10’x12’ stalls with comfort mattresses and automatic water bowls. Plus, there is a large foaling stall. There are 2 heated tack rooms and a hot and cold water wash bay. The indoor arena has washed sand footing. There is a viewing room with a kitchenette and internet access. There is indoor storage for bedding and a large hay loft, with a capacity of 10,000 square bales. The 100’X200’ outdoor arena has a sand footing mix.